NETWORK FINALS: THE VOICE and the 8PM BROOKLYN NINE-NINE gained 0.1 in final numbers, while IZOMBIE lost the same. CABLE HIGHLIGHTS: TNT’s NBA PLAYOFFS game dominated Tuesday cable at 1.81, while NBC Sports Net’s NHL PLAYOFFS game was at 0.40. 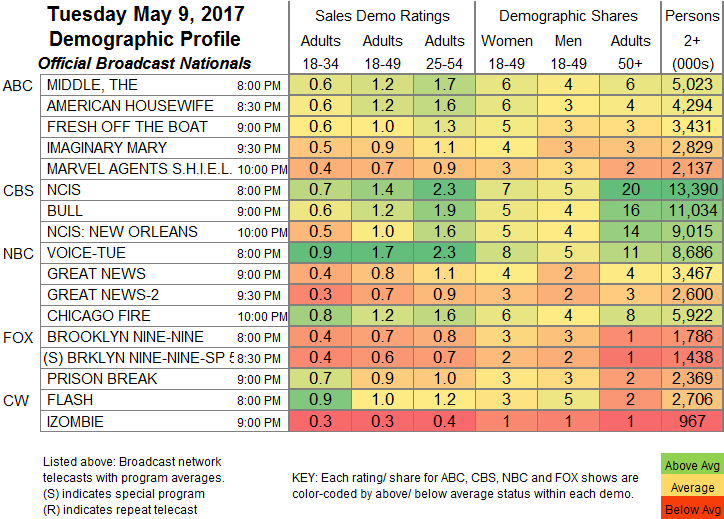 On USA, WWE SMACKDOWN ticked down to 0.74, and TEAM NINJA WARRIOR was steady at 0.30. Discovery’s THE DEADLIEST CATCH lost 0.03 to 0.51, and COOPER’S TREASURE was down 0.03 to 0.29. OWN’s IF LOVING YOU IS WRONG rose 0.06 to 0.49. Not surprisingly, it was a big night for TV news, and especially for Fox News’s competitors, giving MSNBC’s THE RACHEL MADDOW SHOW a 0.48 in the 18-49 demo with 3.4M total viewers, and CNN’s ANDERSON COOPER 360 0.46/2M in the 9PM hour, while TUCKER CARLSON TONIGHT was at 0.37/3.4M. History’s FORGED IN FIRE gained 0.05 to 0.46. On Freeform, PRETTY LITTLE LIARS climbed 0.05 to 0.45, FAMOUS IN LOVE was up 0.02 to 0.12, but TRUTH & ILIZA shrank by 0.01 to 0.02/85K. On MTV, the season finale of THE CHALLENGE dropped 0.06 to 0.42, with a 0.22 AFTER-SHOW. Bravo’s BELOW DECK grew by 0.07 to 0.41. 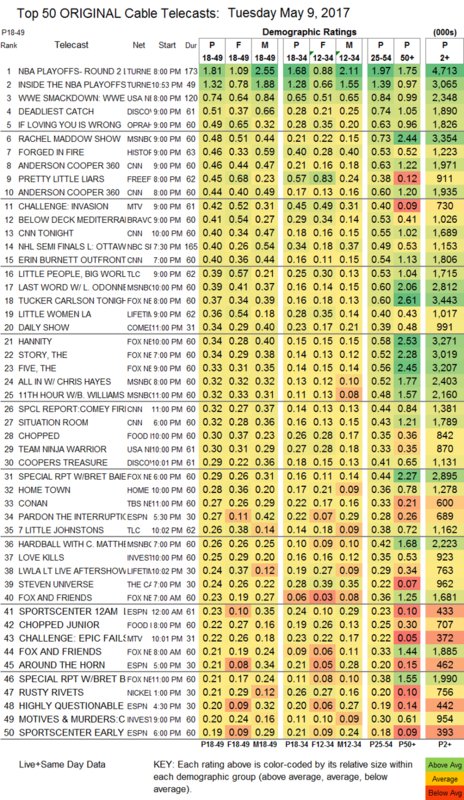 On TLC, LITTLE PEOPLE, BIG WORLD fell 0.06 to 0.39, and 7 LITTLE JOHNSTONS was down 0.05 to 0.26. On Lifetime, LITTLE WOMEN LA fell 0.02 to 0.36, and the AFTER-SHOW was down 0.04 to 0.24. On Food Network, CHOPPED ticked up to 0.30, and CHOPPED JR was down 0.02 to 0.22. HGTV’s HOME TOWN dropped a tenth to 0.28. On ID, LOVE KILLS edged up 0.02 to 0.25, and MOTIVES & MURDERS was down 0.02 to 0.20. BET’s REBEL held at 0.16. FX’s THE AMERICANS ticked up to 0.16. On NatGeo, GENIUS lost 0.02 to 0.14, and BREAKTHROUGH remained at 0.05/307K. Comedy Central’s PROBLEMATIC was at 0.13.